Japanese Episode DP 173: "The Metamon Transformation Battle! Which One is the Real One Nyo!?" American Episode 1316: "Dealing With a Fierce Double Ditto Drama!" Satoshi and Hikari are preparing for their upcoming competitions. As they're training, a wild Potchama appears and begins eating all the food Takeshi had been preparing for his friends! Shortly after, a second Pikachu appears! The young trainers watch as doubles of all their pokemon begin to show up, one after the other. Eventually, it is revealed that the copies are actually a pair of Metamon owned by a rookie trainer named Makina. The young girl, who had only been traveling for about a month, boasts about being the strongest trainer and decides to prove it by battling Satoshi. Satoshi's Goukazaru and Pikachu manage to defeat both of her Metamon, launching Makina into a tantrum. Eventually, our heroes learn that she's not the tough girl she pretends to be and is actually clueless when it comes to battling. Takeshi decides to take the young rookie under his wing and teaches her the basics of making her pokemon stronger and about type matching. During his lesson, the Rocket-Dan appear and kidnap the two Metamon! Satoshi and the others catch up to the trio and begin a battle. After Makina's reunited with her Metamon, she uses the knowledge she gained from Takeshi to command her pokemon to victory. After the Rocket-Dan are blown away, Makina parts way with her new friends, thanking them for all their help. Later, Satoshi and his friends arrive at Risshi Lake, home of the Grand Festival! Will Hikari be able to rise up and become a Top Coordinator? To be continued! We're in a part of the series that's focusing on Hikari a lot. This isn't a problem, of course, but I do appreciate the fact that the series threw us a non-Hikari episode like this to mix things up a bit. This episode reminds me of several other episodes. I'm getting flashbacks to that Lishan episode we had earlier in Diamond & Pearl because of the way it's kind of split into two stories with very little connecting the two. Isn't it weird how Takeshi just suddenly becomes active in the second half of the episode when he hadn't really been doing anything in the first half? Another thing that stood out about this episode was the final scene. The way the gang shows up at Risshi Lake at the tail end of the episode reminds me of the episode before the Kyogre / Groudon two-parter in Houen, or the skipped clip show episode before the Grand Festival. I'm not a fan of the show's tendency to tack something important to the end of an otherwise filler episode, so I'm not really digging it here, either. Those final shots at Risshi Lake are so jarring, and I really think the episode would have been better off without them. Comparisons between Makina and Imite are to be expected, but the writers managed to make Makina stand out by not knowing as much about pokemon as the green haired girl in Kanto. I also kind of dug the whole Ohba idol worship thing because it's something that makes Makina unique, though I do wish we could have been treated to a meeting between the two. Wouldn't you love to see how Ohba would react seeing this girl running around looking like him? Of course you would. The dub features Lisa Ortiz using that one voice she uses for every filler girl she voices because, y'know, why not? In other news, the official website calls Narissa "Marina," for some reason, adding one more item to the hilariously long list of alternate COTD names given to us by TPCI's website. Metamon keeps its Japanese voice when it's transformed into Pikachu and Togekiss. The first little change doesn't happen until a few minutes into the episode. That's certainly a refreshing change of pace! Ash: "I could use Draco Meteor once more." Ash pretty much says the opposite of what Satoshi says. 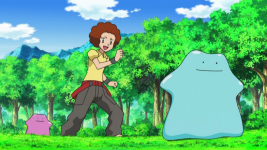 Originally, Fukamaru's trainer says that he can't ask his pokemon to use the attack again, implying that it'd be out of line for him to continue subjecting Potchama to its attacks. Soon after that, Makina appears. In the Japanese version, the nickname she has everyone call her is Makkiina (マッキーナ), while in the dub, it's Rissa. It's kind of nice that the dub decided to retain characters' nicknames again after they completely ignored them just a few episodes ago. Speaking of Makina, she uses a lot of slang in the Japanese version. The English version tries to recreate this by giving Narissa lines like "lookin' for my homies" and "newb." Rissa: "Back where I come from, they call me 'the rumbler.' Wanna fight? I'm ready." Ash: "'Rumbler'?" What's that mean?" Rissa: "You just keep your shirt on! Haven't you ever heard of a rumble?" Ash: "OK...I'm on your side." This one's pretty amusing to me because the dialogue in the English version doesn't even try to make any sense. Rissa's getting upset because Ash doesn't understand a term that she doesn't bother to explain to him? And then, suddenly, he's "on her side?" What? The Japanese version has a pun involving the word yankii (ヤンキー), or "Yankee." In Japanese, the word has two meanings. One is "American," the same way non-Americans use the word, and the other is "punk" or "hooligan." Makina brags about being a "Yankee," probably with the second meaning in mind, but Satoshi mis-hears what she says and thinks that she's saying "Mankey" instead. Makina, upset at being compared to a monkey pokemon, angrily corrects Satoshi. The bit ends with Satoshi apologizing. We Americans don't tend to use the word "Yankee" to refer to ourselves unless we're talking about people in the northern part of the country, so this joke wouldn't have made much sense if it was translated as-is. Still, I wish TPCI had just replaced the word "Yankee" with some other word that rhymes with Mankey (I dunno...cranky?) or had at least written something that made more sense than what they ended up with. As it is, the "rumbler" conversation seems like an awkward non-sequitor. In the second half of the episode, Takeshi decides to help Makina think about her battle strategies. During all the training scenes, Makina refers to Takeshi as sensei, or "teacher." This isn't carried over in the dub. Jessie: "We're always happening, it's a natural fact." James: "We're brimming with tactless tact!" Meowth: "And your team is sacked!" In the Japanese version, Musashi and Kojirou recite their regular motto, and Nyasu chimes in and says that they're going to cut it short this time. I always laugh whenever TPCI gives Meowth lines like this, which is to say that I laugh a lot. I don't know about you guys, but when I think about a pokemon based on a maneki neko, the first thing that pops into my brain is "Yiddish exclamation." Jessie: "A triple Thunderbolt is three too many." James: "One Pikachu punch is plenty for me." Meowth: "Three's over the top. What if we had to deal with triple twerps!" Jessie: "We'd say this three times as often!" Team Rocket: "We're blasting off again-gain-gain!" In Japanese, the attack known as "Thunderbolt" in the west is called juu-man boruto (１０まんボルト), or "100,000 Volts." When the Rocket-Dan are blasting off here, Nyasu states that they were hit with an attack three times as powerful as 100,000 Volts and dubs the new attack "300,000 Volts." Everything else about the dubbed version of this conversation is accurate, amazingly enough. TPCI even recreated the ya na ya na ya na kanji! part!